By EMMA NORMAN- Each year, the IUP Eberly College of Business hosts FBLA members from all over the Region 3 Area in the FBLA Regional Conference. The conference determines who in each business event qualifies for the State Leadership Conference. This year an astounding sixty-eight students from Indiana Senior High School qualified for the state conference. The State Leadership Conference will be held in Hershey during the month of April. The events range from Accounting and Financing, to Publication and Graphic Design. Students can choose an event depending on whether or not they choose to take a test or present a project. Both the FBLA students and their advisers are looking forward to the thrill and challenge of taking the next step and competing at the state level. Each year, the IUP Eberly College of Business hosts FBLA members from all over the Region 3 Area in the FBLA Regional Conference. The conference determines who in each business event qualifies for the State Leadership Conference. 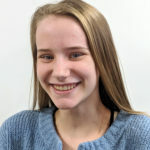 This year an astounding sixty-eight students from Indiana Senior High School qualified for the state conference. 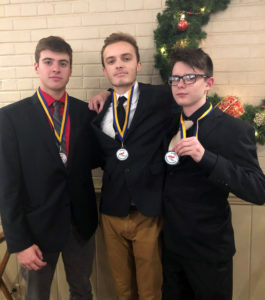 Photo Caption: FBLA state qualifiers sophomore Austin Homer, along with juniors Jack Finegan, and John Gunter are looking forward to the state tournament in Hershey, PA later this spring.